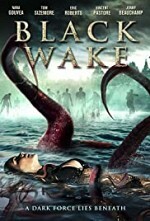 Watch Black Wake: Specialists gather in a top-secret facility to investigate a series of strange deaths on beaches along the Atlantic Ocean. One of the team's scientists (Nana Gouvea) examines video evidence to uncover a possible parasitic explanation for the fatalities. But when a determined detective (Tom Sizemore) sends her the crazed writings of a mysterious homeless man (Jonny Beauchamp), the scientist slowly learns that the actual threat may be more dangerous -- and far older -- than anyone ever imagined. Can she convince her colleagues (led by Eric Roberts) of the true danger before an ancient force rises from the sea to bring madness and death to all of humanity?